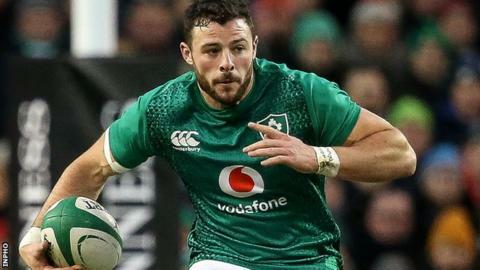 Robbie Henshaw is the latest player to commit his future to Ireland after signing a three-year contract extension with the Irish Rugby Football Union. Henshaw, who will play for Leinster and Ireland until at least June 2022, said: "It's an exciting time to be part of Irish rugby." Johnny Sexton also signed a new deal with Ireland this season. Henshaw could play in Saturday's Six Nations game away to Italy after injury ruled him out of the win over Scotland. He suffered a dead leg in the opening round defeat by England, while operating in an experimental full-back role. The 25-year-old has earned 37 caps but injuries have curtailed his number of appearances. He sat out the last three games of last season's Grand Slam success and while he returned to the Irish midfield to start all three tests in the summer series win against Australia, missed out on the historic win over the All Blacks in Dublin in November after damaging his hamstring in the warm-up against Argentina. The Athlone native was involved, however, in the first victory over the Springboks on South African soil in 2016 and scored the decisive final try in the win over New Zealand at Soldier Field, Chicago. He also toured New Zealand with the British and Irish Lions in 2017 making four appearances. "Robbie has established himself as a leader within this Ireland squad and has delivered consistent world class performances which have helped to drive the sustained success enjoyed by the national team," said IRFU Performance Director David Nucifora. "He has a hunger for improvement and in driving the standards of those around him." Henshaw has enjoyed considerable domestic success, first with Connacht winning a Pro12 title in 2016. He also won a European Champions Cup and Pro14 double last year with Leinster. "Having tasted success with both Ireland and Leinster in recent seasons I am eager to play a role in driving further success at both international and provincial level," Henshaw said.